Here you can read a selection of testimonials from former course participants at Githa Ben-David's International Education in Vocal Sound Therapy, The Note from Heaven. You can also see some photos from Githa's previous courses here. I attended a week long course with Githa in Ireland in April 2018. The course was training in Vocal Sound Therapy. The course was done through English and 30 people attended mostly from Europe and one American. I work with music for a living so I understand the importance of music and sound and how it can effect our mood and well being. The course blew me away with the power of the human voice and how it can heal deep traumas within on one level and how it can harmonise our very being on another level. 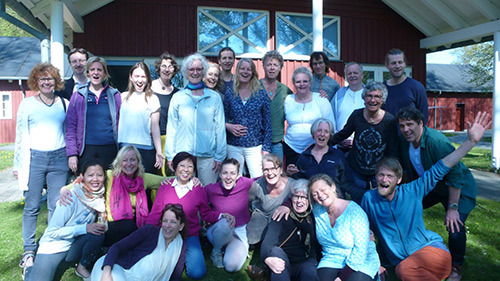 The course has a mixture of lectures from Githa from her book 'The Note From Heaven' and exercises and practise with other participants in small groups. It was an early start each morning from 7am to 9am with yoga and breathing and Hung Song method which helps with rebalancing the endocrine system. I am not a morning person but I found I had a really good energy when I was doing the course as the exercises and daily practises really energised my being. Githa has a lovely relaxed style when sharing her lifelong knowledge of sound healing and was able to hold the space for everything to go smoothly. Some of the work was quite intense particularly when she was dealing with deep rooted trauma when giving a demonstration but it was always handled in a soft gentle supportive safe way which helped with the overall healing on the course. The course was well run and the food was organic vegan/vegetarian and staff at the venue were so helpful and respectful. I would highly recommend this course to anybody interested in developing the voice as a healing mechanism or tool. We all have this power within our voice if we allow ourselves to connect to spirit. Githa has a genuine love and passion to teach others to use their voice in a positive way to heal others. I will continue with this practice and plan to complete the four weeks training over the next few years. The warmest thank you for a fantastic retreat. It’s a brilliant education you have pieced together - and very vibrant. It’s just as much a space for the magic as it is presentation, experience and training. Just returned from an incredible week with Githa Ben-David and 30 students at the Cliffs of Moher retreat in Ireland. Your teachings are from heaven here on earth. The Note from Heaven hits me straight into my soul and resonates with every step. And today I went straight on with a sound healing, given to my neighbour. Love light and deep gratitude for showing me this path. Looking forward to work with you again. Thank you so much for the week. It made a deep impact for my life and lead me back to the feeling, that I know who I am and what I really want. This was possible because I got in contact with my feelings again and lost the fear of feeling them, even the bad ones. With the work we did and the work that I will do in the future I am confident to live a life in love and honesty to myself and to my partner. The Note from Heaven is such a great tool not only to get in contact with the own inner being but also as a tool for healing and opening the heart of others who want to be touched. I am looking forward to seeing you all again. The group was very special to me because of a lack of judgement. I had the feeling, that I could be how I am. Thank you also for your guidance because a group is defined not only by all participants but by the leader. And we all felt very thankful that you lead us through this wonderful week in beautiful Ireland. The new structure of the education is so FANTASTIC. You really get the method under the skin when you are working so intensively with the sound in a whole week. You have been a fantastic inspiration for me, and my Note from Heaven practice has been helping me personally a great deal. Our week with you was amazing - I got so much from it, thank you immensely. Thank you so much for a fantastic and shocking course! I am both happy and shaken in my soul. I had never imagined that I should be able to heal others... I just want to say thank you and I expect to attend the next course. Thank you a thousand times for an indescribably luminous week. I’m looking so much forward to the Spring course! I have just had a session with my mother and her tinnitus went down from 8-9 to 5. That was a really good first experience, and I just want to go out over the steppes and practice on ‘guinea pigs’. I participated in the 7 day long course in the Winter at Githa’s new sound therapist education, and I got overwhelmingly much out of it and I will definitely come back. I recommend it most highly to all other fully-trained sound therapists. It’s a wonderful combination of continuing education, self-development and a united sound family party! Thank you a thousand million times for a really great course in every way. I have got such a great gift with me home from Heaven and from you and from all the other participants. I have already signed up for the course in November! I would like to thank you for a truly splendid and deeply moving week. I felt I was among gods and goddesses and receiving inspirational teaching as well as being cared for by so many kind and loving people. Thank you for a wonderful course, Githa. I really feel that my voice has opened up by following your teachings, and I also feel so inspired to write music. I will definetly join your course again. It has really been transformative and powerful for me. Thank you. It has been a fantastic week. Something really unique came out of it. We still have high vibrations in the body and we have learned much. Thank you for it all. Thanks for being you! Dear Githa, it was a great time together with you. You did a top week. I enjoy your warmness a lot. It teached me as well how to make more contact with the spiritual world. Thank you for, yes to to put it briefly a life-changing week in Hou. It is a long time since I have felt so fundamentally happy, grateful and at home. The good thing about it is that the feeling continues here at home.